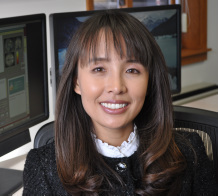 Pilyoung Kim is an assistant professor in the department of psychology and the director of Family and Child Neuroscience Laboratory at the University of Denver. She received a Ph.D. in developmental psychology from Cornell University and received postdoctoral training in developmental affective social neuroscience at the National Institute of Mental Health. Her NIH-funded longitudinal research program focuses on investigating how poverty influences brains of two generations – new mothers and their infants. She and her team investigate the roles of prenatal and postnatal exposure to poverty and stress in (1) neural adaptation to parenthood in new mothers and (2) brain development in infants and young children. Her primary research method is pediatric neuroimaging using a functional magnetic resonance imaging (fMRI), which enables strong research investigation into environmental effects on human brain development. She has over 50 publications and was awarded the Victoria S. Levin Award for Early Career Success in Young Children’s Mental Health from the Society for Research in Child Development.